Twilio SMS extension allows you to send SMS (leads, contacts, employees, prospects, users accounts) and receive ( from Twilio) with details such as message, date and time of SMS, status, etc. 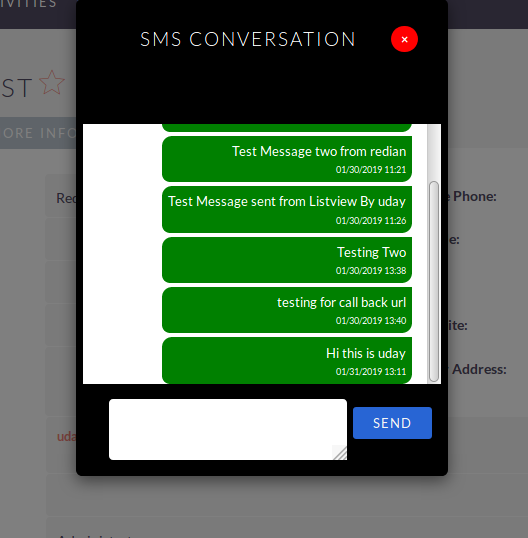 Allow you to effectively communicate through Twilio SMS data across SuiteCRM. SMS logging provides a means of reducing call costs by analyzing call records. A business can see who has answered each call, how long it takes them to answer the call and how long they spend on the phone. This helps business owners to have confidence that their staff are handling calls quickly and efficiently, as well as highlighting staffing level requirements across the day. Often the call log is shown on an intelligent wallboard display, constantly monitoring staff effectiveness. Using a call logging can help owners to drive sales, improve staff performance, win and retain customers, deter fraudsters, and quickly settle customer disputes. Enable you to connect with your contacts better which will help your business generate more revenue. If you are using Twilio Trial Account. You must have to verify your number for SMS service.